Now that Iran is sitting on a pile of cash and the import ban on conventional military hardware has been partially lifted following the nuclear deal, the Islamic Republic is looking to replace its hodgepodge of vintage military hardware. This may soon include producing Russian Su-30 multi-role fighters and T-90 tanks within their own borders. Russia’s advanced Flankers have been increasingly popular on the export market, especially as they have been flying operational missions over Syria for the last four months. The idea that Syria has become a showroom for Russian weaponry has been fully established, and even the Russian Air Force’s most advanced operational fighter, the Su-35, is now flying missions over the war-torn country while the export orders pile up. 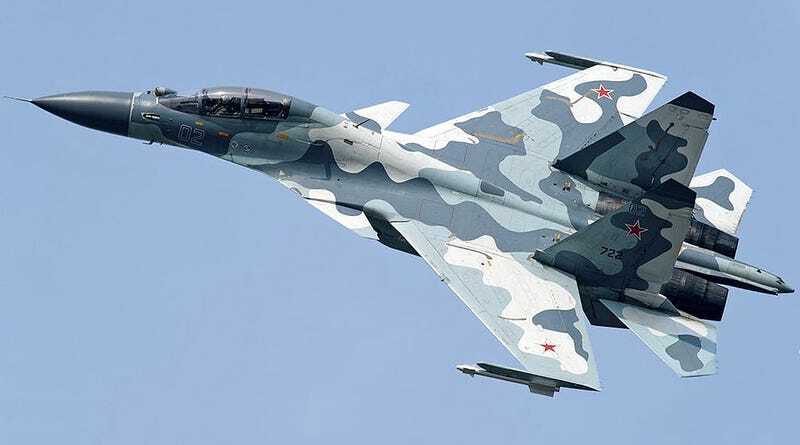 But the Su-30SM was in Syria first, right as Russia’s air campaign began, and its multi-role capability, high maneuverability, two-seat design and attractive price have made it a hot seller internationally. Now it looks like Russia’s new best friend with plenty of money, Iran, is looking to get in on the Super Flanker action. According to Janes, a deal for Iran to buy Su-30s seems to be all but certain at this point although details remain scarce as to how many aircraft and of what Su-30 sub-variant will be procured. Iran’s defense minister General Hossein Dehghan said during an interview with a domestic news service that some sort of production within Iran will likely be part of the deal. Iran is already receiving a late version of the S-300 air defense system from Russia in the coming months, a deal that has been in the works for a decade. The addition of the Su-30 to the Iranian Air Force would give Iran a massive increase in air combat capability and it may allow them to finally retire fighter aircraft that are extremely troublesome to keep operational. This includes a couple dozen of F-14A Tomcats that have soldiered on against incredible odds almost three decades after support for them was totally embargoed. The air is not the only place that Iran is looking to drastically upgrade its combat capabilities. The T-90S main battle tank has also been on their wish list for some time, and like the Su-30, Iran has floated the need to build it locally should they move forward with the purchase. According to Defensetalk.com, Iran’s last batch of imported tanks arrived from Russia and Belarus in 2002 and were T-72M1s. These tanks were not exactly state of the art at the time, and since then Tehran has tried to produce their own advanced tanks, although none seemed to have ever entered large-scale production. So like its air force, the majority of Iran’s tanks are pre-revolution vintage and stand no chance of taking on Sunni Arab gulf states inventories of advanced western tanks models. Building the T-90S locally would not only increase Iran’s technical know-how and provide industrial offsets, but it would also insulate Iran from potential future sanctions that may make importing such weapon systems impossible, at least to some degree. Alternatively, Iran could decide to bypass even the decreased conventional arms sanctioning regime that remains in place by building or highly modifying one of their indigenous tank designs with direct help from Russia. This tank would likely be based on the highly successful T-72 chassis, much like the T-90S. Under such a scheme, Iran could probably come close to reaching the T-90S capability-wise while still keeping the design largely a local one when taken at face value. This would help bypass potential future sanctions altogether, and if successful, it could provide the Iranian Army with a reliable source of somewhat modern heavy armor, something they have never had before. In fact, Iran’s head ground combat general, Ahmad Reza Pourdastan, said recently said that the T-90S deal is off and that Iran would pursue a scheme exactly like the one above, although he didn’t mention retaining foreign help of course. This is an interesting development, but we will have to wait and see if his statement ends up being the final word on the matter. If nothing else, history has taught us that Iranian arms deals can be their own saga in themselves, being declared dead one day only to rise from the grave the next. One thing is for certain: Iran is actively rearming and will likely pose a much more potent conventional threat in the not so distant future. The leaps in capability we are talking about here are fairly massive, moving from F-4s, MiG-21s and jury-rigged Tomcats, all featuring 1970s technology at best, to some of the most advanced fighters Russia has to sell. The same can be said when it comes to the introduction of the S-300 air defense system. Although it is no longer the pinnacle of Russian air defense capability, it remains a deadly weapon system with considerable range. Above all else it is many times more potent than the mix of Hawk, SA-2, SA-5, as well as other indigenous systems, many of which have questionable performance, that Iran currently fields. All this will just accelerate the emerging arms race in the region, one spurred by increased tensions between Sunni-ruled gulf states and Shiite ruled Iran. The outright proxy war between the two sides in Yemen has only added to this increasingly militarized state in the region, with Sunni gulf states buying new fighters, helicopters, air defense systems, fighting ships, tanks, and all sorts of other weaponry at an incredibly fast pace. Will The White House Finally Clear Qatar To Purchase 72 F-15 Strike Eagles? Although Iran will remain dwarfed capability-wise by its all of its oil-rich Sunni neighbors combined, an Iran with a modern military is something the region has not had to deal with for decades. As the country’s remodeling of its conventional forces evolves it will be interesting to see how its neighbors react. The West may have a nuke deal with Iran, but it doesn’t make them or that region any less volatile.